When I decided to stop training running contacts, a friend (who obviously knows me better than I know myself) laughed and said I won’t be able to stay away from them for long. She was right. I love everything about running contacts… the fluidity for performance, the rush of running alongside the dog, the thrill when you see your dog run a full height dog walk for the very first time after months of training. Everything except a whippet falling off the dog walk because they were too crazy and misstepped and couldn’t hang on. That part is no fun at all. So I was thinking… what if Java wouldn’t run full speed? I’m not talking about trotting across the dog walk, but a bit less than crazy full speed running would be nice. And especially, running in a bit calmer state of mind. Could I train a slightly slower and safer dog walk performance? I heard the warning many times that if you don’t train with maximum speed then you might never get a maximum performance of that obstacle, and that would actually work in my favor here. But can I teach the dog to consistently hit the contact while NOT running full speed? Daisy Peel adapted this method so that it can be trained at lower speeds as well and it seems that she is able to train dogs to a decent level of performance without the necessity of running full tilt from the start. So that myth is busted. She trains using a Manners Minder, which for many dogs automatically results in less speed. So this method would be a natural choice for me, right? I would also like to change another part of the method: run the dog over a plank at ever increasing heights and click when she is running nicely (without leaping) AND hitting the contact. That’s simple for the trainer (once they learn to see the footfalls), but if I had you run for 10m and click for quality of one of your footfalls, how long would it take you to realize exactly which footfall I’m clicking for and which quality earned you that click? which would then press the button on the clicker. By the time you would hear the click you would be at least one stride further down the path. The only way to have good timing is to start *predicting* whether the dog is going to hit and clicking in advance. Otherwise you’re clicking on her first step OFF the dog walk – which is just about the worst timing possible, as you don’t want the dog to focus on how to get to the ground as soon as possible. Well, Ruby also didn’t belong to either of those groups of dogs, I just persisted long enough that he somehow figured it out. But there has to be a better way, right? Devorah Sperber of Art And Dog Blog got me thinking about building a Clicker Board, which is a great idea since it’s cheap and ensures perfect timing of the click. I even bought a board and a bunch of clickers to test it 🙂 Unfortunately I don’t have my own dog walk to incorporate the clicker board onto, so I would have to use it on top of the club dog walk and I felt it was too bulky for whippet sensitivities. There used to be a widespread belief that foot targets were an ineffective way of training RC, but these days I see more dogs with beautiful running contacts that were trained that way. Another myth busted. Of course a foot target needs to be faded in the end. Still, if it helps to bring clarity I’m all for it. A year ago I tried Dawn Weaver’s method because her dogs seem to have a very controlled style of running the dog walk, no craziness (yay!). I am not at liberty to discuss the details of her method, but will say that her dogs have both stop and a run and her method reflects this. Unfortunately Java became quite conflicted over when she should stop and when she should run. Then she got injured in April and I had a lot of time to think. I was crushed. I thought what’s the use in training a really really difficult behavior when the dog could get injured at any time (not necessarily during agility, but even out on a walk like Java). 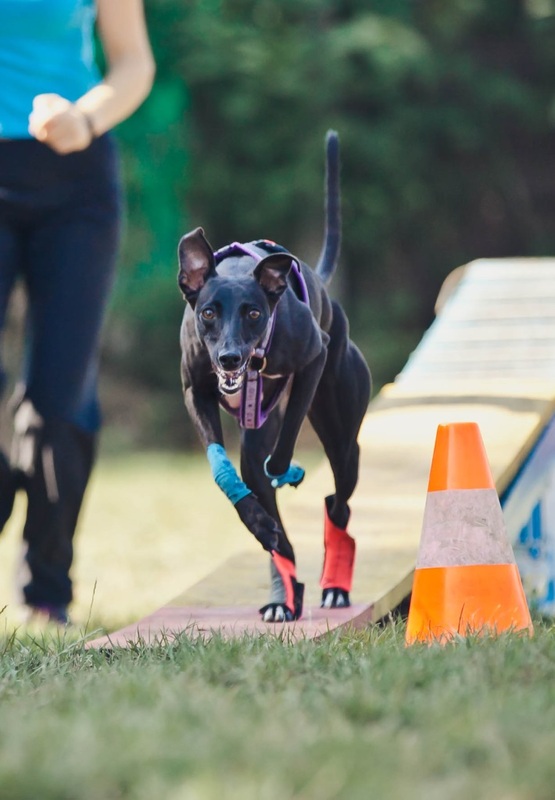 Even the big names of agility world take two years or longer to train all possible entries and exits to a running dog walk in all sorts of situations. Running contacts might *look* trained once they start using them in competition, but there is a lot to be done still. Wouldn’t it be wiser to just go with 2o2o like I first planned so we could finally start running agility courses? OMG….RC’s have been the worst thing for us. My Bing had the most beautiful 2 on/2 off until I started teaching her RC’s. She is SO perfect at home…I’d say 99% accurate whether I say “run” or “target”. But trials are a different excitement level that are impossible for me to duplicate at home. We get lots of leaping. I can’t blame her…she’s excited and loves the contact obstacles. I tried “punishing” her by asking for a ‘sit” after she would leap (suggested by a top notch instructor) , but that led to avoidance of the DW or AF. So now we just train, train, train, trying to hype her up , throw bait bags, toys, let other dogs run around and see if she can do what I’m asking. Sometimes I use the automatic treat dispenser. People have said to me that I shouldn’t let her get away with it. Well, maybe I’m just too soft a trainer, but I will not punish her by walking her off the course when she leaps. Either she gets it or not at a trial. I do say “easy” because, like you, I want her to slow down a bit and think about her exit. Sometimes it works. I feel your pain! It’s so exhilarating for both of us when they get that RC. I had a friend make a “hit it” board for me, but She leaps over it even though when it’s on the ground she’ll run over and make it click. Seems that with her there’s always a challenge of some sort when it comes to AF and DW. It sure keeps the sessions interesting! The thing that I always try to remember, even if I feel frustrated, is that she is never intentionally “bad”. She’s doing the best she can do with me as her handler. Good luck to you and Java! You’ll get there and I look forward to reading about the journey! Do I understand you correctly that you kept the 2o2o as well (I assume that’s the “target” behavior)? Yeah it’s so difficult to replicate the arousal from a trial environment when training at home. Maybe you should get a few barky dogs to create some excitement? Or someone else playing fetch with another of your dogs while Bing runs RC? Or do RC when hubby comes home (before she says hi), to get a similar excitement as in a trial? I heard the recommendation to have the dog sit/lie down as well. I think Ruby could take that without batting an eye and would be just as crazy for the rest of the course. I don’t think Java could. Each dog is different. yes, that is correct. at home she can do either a 2 on/2 off or a running with 99.9% accuracy. not so at a trial. i like your suggestions of what to do to amp up the arousal level….great ideas! at 8 years old, i figure she’ll calm down one day and be able to “listen” when I tell her what i’d like her to do on the contact. lol! actually, i’ve decided that as much as i’d like her to get the contact behavior that i’m asking her to do, i really enjoy every second that we are out there together, running fast, having fun and there’s no room for frustration. i tell myself…just learn…she’s trying to teach you something. it’s up to me to figure out exactly what that is. some days i feel like she’s a lot smarter than I am! You’re welcome 🙂 Are you in the process of training running contacts, Nadine? All my dogs have had running contacts on the AF and I have the option of running or not on the DW. I have never done 2ox2o on the AF. I have not used any fancy training. Dogs run low AF, starting by following my hand up and down, with reward thrown ahead in a straight line, gradually increase height and my distance and positioning in relation to the frame and drop the hand target entirely pretty early on (after a couple sessions). My first dog was a 22″ BC, back when no one around here did a running AF (like 2002), and I heard from many that it was just his natural stride. Then I got my first whippet, 20″, and heard the same thing, although the two dogs had markedly different stride lengths. Second and fourth whippets a bit bigger at 22″, third smaller at 19.25″, same statement made to me. Mini poodle, 15.5″, also fostered a 14″ JRT with running, again I heard that I was “lucky” that their natural strides are conducive to running contacts. Now I have a 17″ whippet girl and she also has the same great running contact. Same thing with 11″ chihuahua. Guess what, peeps, it is not that I was “lucky” to have 7 dogs ranging in size from 11″ to 22″ that all “naturally” hit the contacts, I trained them to do it. However, they never did anything else and I think it is much easier to train the running from the start than to switch. So do you think they learn to focus on the contact with time even when your hand isn’t there to help them? Do they ever miss the contact during this training and what do you do if they miss? Even when Ruby had RC on the dog walk, this didn’t transfer to Aframe (like some trainers claim it does). For the first session we actually tried getting him to focus down by showing him a toy as he came over apex, but he didn’t care about the toy at all 😀 I think the problem was he already had the confidence to run FULL speed over the Aframe (because of all the RC training on dog walk) and he didn’t care about some stupid non-flying toy at that point. Andreja – the hand is faded out very, very quickly. They all have independent Aframes, but being whippets, if I don’t run the DW with them, they stop and look at me. So, if I want them to stop on the DW contact, I just stop moving. They rarely ever miss AF contacts, or any contacts for that matter. But, you start low and only reward when they hit the contact. They do figure it out. I do it from all distances and angles, and sometimes stand adjacent to the apex and have them run back and forth. My 14-yo whippet boy and 11-yo whippet girl had no problem with the method, neither did my BC, who passed away last year. The poodle was a fairly cautious girl, and so it was more natural for her not to jump off. My 20-month-old little whippet is very bright and hers is the most independent, very like my BC’s was. Really, it is mostly muscle memory for my guys, I think, and wicked good rewards. Did you train them to run through the contact on DW? I saw a few untrained whippets going across DW and they all jumped over the contact as soon as they got any speed across the plank. Ah RDWs! I don’t know what method yet I want to use with Zumi. My current inkling is to do some target work on the ground while starting STs full speed running on the plank. I personally didn’t like what I saw of DPs manners minder method, but I’ve also had dogs who if you don’t start with full speed it’s really hard to get it later on. I don’t know enough about other methods to have an opinion. I feel your pain though! My poor corgi suffers from being dog #1 and was retrained so many times in various stopped contact methods and a few attempts at running! The closest I got to running dogwalks with him was by using STs method but with a shelf liner mat on the bottom to encourage less leaping and more awareness. So if I understand you correctly the main reason you don’t like DP method is because with some dogs you cannot get a full speed dog walk that way? Or was there another reason? Yes-ish. It’s not that I care about maximum speed but I do want speed and I think it’s hard for some dogs to gain it if you start slower. Kinda like 2x2s vs channel method. Most dogs it doesn’t matter what method you use, you’re going to have fast weave poles regardless. With understanding speed can increase. But the less drivey the dog is, I think the harder time you have trying to build it back in and channels are currently one of the go to methods to try and create that speed. With my Vito, his running dogwalk (Silvia’s method) is pretty close to full speed in practice. In a trial, everything gets slower for him and working on drive and motivation is thus my top priority. But the dogwalk and aframe are like a power booster with him and while he’s still not as fast as he is in practice he accelerates on them. Part of that is likely reward history, lots of balls for running fast. But I just don’t think I would have gotten the same results without having speed from the start. Now my corgi, DPs method likely would have worked well for him. He loves to run and when I was using the little mat on the end he liked the more concrete criteria. It made sense to him. (Although I still never got to full height and gave it up.) I just think in general, the more sensitive/harder to motivate dogs are going to have a hard time gaining the speed I want if they’re doing a lot more thinking in the beginning vs starting easy enough that they don’t have to think and only have to run. Yes, this makes sense. I’ve been thinking a lot about whether a certain method could slow Java down more than I would like on a dog walk and I came to a conclusion that she is a “fast dog”, her movements were very fast even as a puppy. So that’s what she’s going to gravitate to no matter what I do… I think. I am also reading about different ways to teach RC and I decided to go for foot target but there are many different trainers with slightly different approaches and you can’t really find out much about their techniques until you sign up for a course. Would you recommend a particular trainer? I was thinking about buying Dawn Weavers book but have no interest yet on 2 on 2 off. Do you think it is possible to train only RC with her method? Thanks! If you don’t want to train 2o2o I can’t recommend Dawn’s approach (unless she has changed it in the past two years which I doubt). Susan Garret trains target without 2o2o, but she doesn’t have a course one could join… sorry.